In the 60's and 70's, TV producers were looking for new things to add to the Saturday morning kidvid schedule. Cartoons were the bill of fare, but they were slow and expensive to produce. There were many attempts at live-action series for kids, most were low budget versions of their adventure/comedy brothers in prime time. One especially weird series (and mind you, there were a LOT of weird shows) was "Lancelot Link: Secret Chimp". More than just another sendup of the popular spy film genre - this live-action series featured actual chimps playing all the parts. Two chimps played all of the parts by donning different costumes. The voices were a variety of comic celebrity impressions (could Malachi Throne be far behind?) that sort of synchronized to the chimps chewing at the air. Though forgotten today, the series was the most expensive children's show at the time. A pair of writers from the popular TV spy spoof "Get Smart" penned scripts. There were extensive chimp-sized sets, lots of location work... "Link" was a very ambitious project considering how many Saturday morning live-action series were made cheaply as money-savers over cartoons. Also in strict accordance with Saturday morning cartoon law of the time, the chimps were in a band that released an actual record (and no, they weren't The Monkees, smart guy...). I first saw the show in the 80's on a Chicago TV station's weekday morning cartoon block. I knew that it was old, but it was so odd that the vintage didn't really matter. It was brave television like this that paved the way for other primate-based media ventures like "Every Which Way But Loose", and anything starring Joe Don Baker. 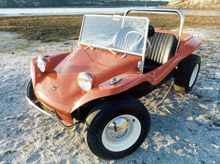 The first Meyers Manx was pieced together by Bruce Meyers in a shed in Newport Beach sometime in 1964. His aim was to create a simple vehicle for blasting around the sand dunes. He and his friends quickly discovered that chunky 4 wheel drive jeeps didn't fare nearly as well as lightweight VW Beetles in the dunes. While he wasn't the first to create a VW-based dune buggy, his sleek vehicle took full advantage of the fiberglass molding skill he'd picked up while working at Jensen Marine. Meyers spent almost two years perfecting the distinctive Manx design. The kit came with accessories such as lights, seats, and windshield. His first version replaced the Beetle floorplan with a fiberglass monocoque frame, but he quickly discovered it was too expensive to produce and created a new version based upon a shortened Beetle floorpan. The kit sold for $495, and Meyers figured he'd get a dozen or so orders a year. Things didn't quite turn out that way; the Meyers Manx was featured on the cover of Car and Driver in April 1967, and he suddenly found himself with hundreds of orders. He struggled to meet the demand. Others took notice of his success, and the Manx was suddenly faced with dozens of similar-looking cut-rate competitors. As the market became increasingly crowded, Meyers fought an expensive and unsuccessful lawsuit against a competitor and eventually retreated from his company altogether in 1970. It took another 30 years before he ventured back into the business he once loved -- drawn by the enthusiasm of dune buggy enthusiasts worldwide. 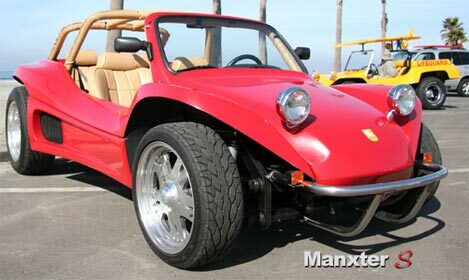 The brand new Manxter 2+2 four-seater hit the market in 2001. Like the original Manx, it is based on a classic VW Type I or Type II floorpan and drivetrain. A bare-bones kit costs $5395, while the more complete 'standard' kit includes a fiberglass hardtop and polished stainless steel front and rear bumpers. An even more rugged DualSport version is available for $9,975. It has 3" more ground clearance, a 6" longer body and heavy-duty long-travel suspension. The Handspring Treo 90 is my favorite "vintage" PDA. It has been out of production since 2003, but I just stumbled across a shipment of "new old stock" units at XScargo, priced at a very reasonable $69.99. The Treo 90 was the least expensive member of the original Treo family. It doesn't include wireless browser or phone capabilities to keep cost (and size) to a minimum. I find the lack of wireless networking isn't a big deal at all -- it keeps me from getting distracted when I'm writing or taking notes. It also makes the unit really lightweight -- the Treo 90 weighs 114 grams, 25% less than a modern Treo 680. I first mentioned my affection for this little machine several years ago and remarked, "Strangely enough, it is close to the ideal PDA. 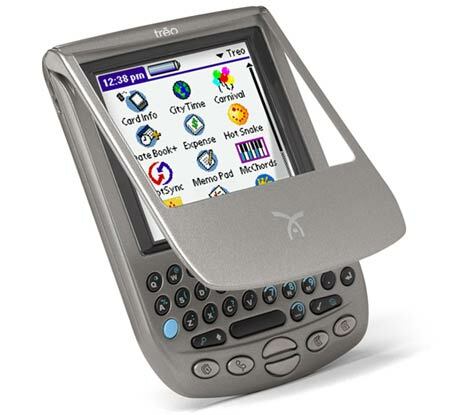 The Treo 90 is compact, includes the WordSmith word processor, a reasonable 16MB of memory, offline browsing and email, and a rechargeable battery." 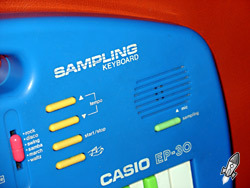 We've talked about the SK-1 -- Casio's highly successful sampling keyboard -- before. The SK-1 was a bit toylike thanks to its size, but it offered a lot of surprisingly professional features. Those more advanced facilities are stripped away in the EP-30, a more clearly toylike keyboard - but it's the only keyboard I know of that features Kermit the frog in top hat and tails. All the buttons look eerily like cold capsules, and they don't have much work to do since the keyboard doesn't really do that much. 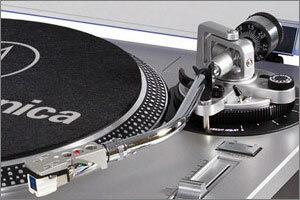 There are five instrument sounds, plus your sampled sound. My favorite part may be that immediately after recording your sample, the keyboard plays it in a quick scale progression - often sounding more musical than anything else I've tried on the thing. You get six of the original SK-1's analog "blip blip" beats, but there's no fill-in drum solo button. It's got a built-in demo song that demonstrates things that you can't actually do with the keyboard - the tune has two different patches playing together, and Kermit is far from multi-timbral. So what's this keyboard all about? It's the green sharps and flats. Now that you've seen this, don't you want to bust out the highway safety paint and spray the black keys on your keyboard green? It's also neat to see a sampler that's clearly meant to be put in the hands of children. 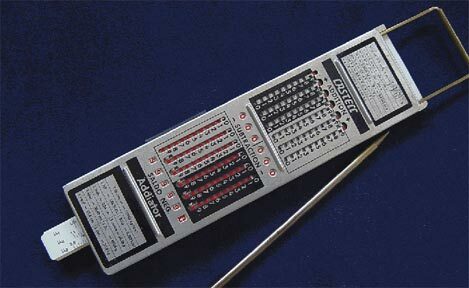 When I look at toy keyboards today I don't know why there isn't one that samples - sampling tech is cheaper than ever. Casio did really well with repurposing their sampling chops. You can read about a couple Casio SK-1 variants below; a pink SK-1, and a very rare double-decker Casio - it looks like a Hammond B-3 in its teenage years. One of these days I'll write about Casio's abortive attempt at professional music gear that also leverages its 1.7 seconds of sampling power. The not-so-hot Atari Flashback and her awesome little sister -- Flashback 2.0 -- will soon have an itty-bitty portable sibling. Curt Vendel, the Flashback's designer, recently unveiled a prototype portable Atari 2600 on the AtariAge forums. 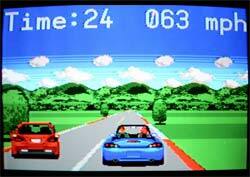 It sports an angular early-1980s design and includes a 2.5" 320 x 240 TFT LCD screen with NTSC A/V output. Power will be supplied by 3 x AAA batteries (just like the Coleco/SEGA handheld). 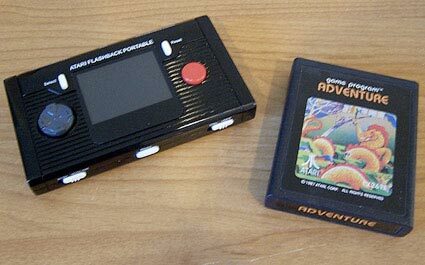 Of course, some sacrifices had to be made to create an affordable Atari 2600 portable: it's not 100% compatible with the original, so some titles that stretched the limits of the original hardware (Pitfall II, for example) won't run. Several 2600 die-hards have also commented on the placement of the d-pad controller, which places the 'fire' button on the opposite side compared to the original Atari joystick. Vendel is aiming for a $39.99 retail price and the black prototype case will be replaced with something a tad more authentic. "A 2600 woody themed case is what is in the works right now," he remarks. Bigfoot: A Protected Species in Canada? Canadian Member of Parliament Mike Lake is seeking to add another creature to the Species At Risk act. The Act already protects Red Mulberry trees, blue whales, and the Whooping Crane, and M.P. 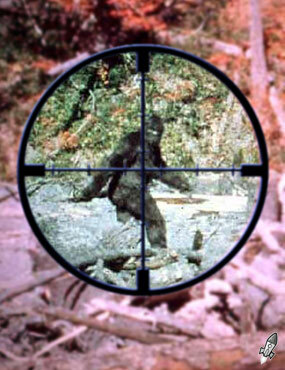 Lake is working to add one more to the list: Bigfoot. For years, tales of the hairy-backed man-beast have abounded, especially in the pacific northwest and western Canada. Lake and his supporters argue that the issue isn’t whether Bigfoot exists or not, but that the creature’s legendary scarcity merits its addition to the list of protected and rare species. Lake has presented Parliament with a petition signed by nearly 500 of his constituents in Alberta, Canada. The petition calls on “the House of Commons to establish immediate, comprehensive legislation to affect immediate protection of Bigfoot." While most scientists dismiss Bigfoot sightings as either folklore or hoax, researcher Todd Standing claims to have proof of the creature’s existence. As a supporter for the petition, he is concerned for the safety of the beast. He told Global National Television News "When I get species protection for them nationwide, I will make my findings public and I will take this out of the realm of mythology. Bigfoot is real." So whether you're a Yukon-bound Yeti, or a Sasquatch from Saskatchewan, you can rest easy that Canadian lawmakers have got your hairy back. Christie's will be auctioning the Bell & Howell Model 2709 camera once owned by Charlie Chaplin on July 25, 2007 [update: It didn't meet the reserve bid]. It is expected to fetch between £70,000 and £90,000 ($140,000 to $180,000). The auction includes a copy of the original sale document indicating that the device was sold to Chaplin about a month after he founded Chaplin Studios Inc. with his brother Sydney in 1918. At the time, this state of the art device sold for $2,000 - about $31,000 in 2006 dollars. 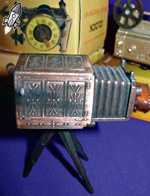 The Bell & Howell 2709 was a hand-cranked 35mm camera that became the mainstay of Hollywood silent movie production upon its introduction in 1911. In fact, nearly every major Hollywood production of the era was shot on a 2709 or its competitor, the Mitchell Standard. Unbelievably, this model remained in production into the 1950s, although I suspect many of the later units were used for animation purposes, rather than hand-cranked live action. Chaplin's company owned three other 2709s, but this camera is special because it was the only camera purchased by Chaplin himself -- one of the few Bell & Howell 2709s owned by an individual. It is very likely that this camera was used to shoot some of his most important work, including A Dog's Life (1918), Shoulder Arms (1918), The Kid (1921) and The Gold Rush (1924), since the studio possessed only one other Model 2709 during this period. 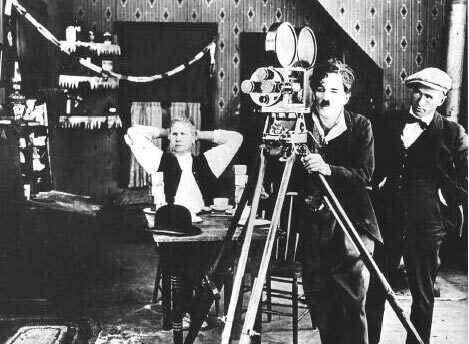 It's also probable that the camera remained at Chaplin's side through the 1930s, when he continued to cling to silent film while others made the leap to sound. As a result, it could have played a role in the production of his highly regarded later works including City Lights (1931) and Modern Times (1936). This auction lot includes the original camera, a selection of lenses, a Mitchell side-mount viewfinder, wooden legs and a pan-and-tilt head, along with four top-mount "Mickey Mouse Ears" 400 ft. Bell & Howell film magazines. Interestingly, the magazines aren't the originals that were shipped with the camera, for the simple reason that these were probably worn out from years of hard use. It is hard to imagine any other vintage camera that had such an enormous impact on the film industry. Modern equipment is usually rented from companies such as Panavision because of its prohibitively high price, so the cameras remain largely anonymous. This particular machine had a far more organic relationship with its owner, since Chaplin and cinematographer Rollie Totheroh hand-cranked many thousands of feet of film through its magazines over the span of decades. The C5 electric runabout was Clive Sinclair's bizarre follow-up to his brilliantly cheesy ZX series of microcomputers. This dodgy little plastic trike was envisioned as an electric runabout that could replace a car for short jaunts around the 'hood. 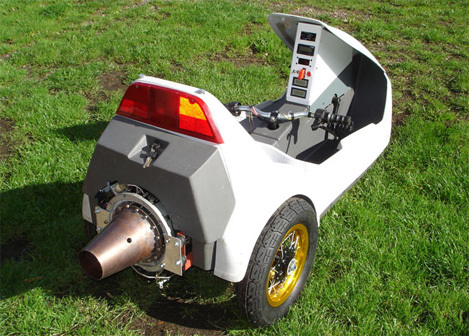 Alas, it's diminutive power plant could only propel the vehicle to about 15 km/h. Here at Retro Thing, we've never asked our readers to get political, but here's a cause all of our U.S. readers can get behind.There is movement to degrade the meaning of the word "chocolate". It's important to take action now as the deadline for public comment is June 25th. The Chocolate Manufacturers Association has petitioned the Food and Drug Administration to allow a new definition of "chocolate". They'd like to be change the requirements so that they can replace ingredients such as cocoa butter and real milk with cheaper substitutes. Right now, products that don't fall within the definition of "chocolate" must be labeled "chocolatey" (check out cheap chocolatey covered marshmallows if you don't believe me) to make the differentiation. 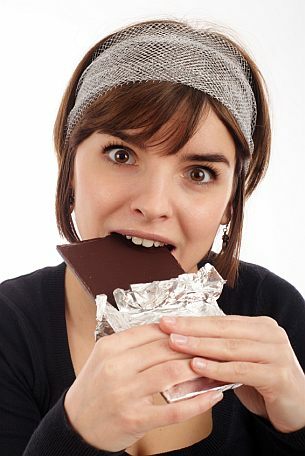 If the FDA lets this change go through, it broadens the definition of what is and isn't "chocolate". The chocolate industry will have leave to change the ingredients in your favorite treats, but still claim it as chocolate. This opens the door for the use of vegetable oils and bad Trans Fats, along with other unhealthy ingredients. Whether they want to or not, chocolate manufacturers will be forced to use these inferior ingredients to remain competitive. It could also drive up the price of genuine chocolate positioning it as a "specialty" treat. My problem with this is that there isn't any consumer benefit. It's all about manufacturers saving money by enabling them to sell us inferior product. "Chocolate" should mean "chocolate", not that waxy crud that covers a Charleston Chew. Should we take this seriously? I certainly think so. Chocolate isn't exactly essential nutrition (though I know people who would claim otherwise), but would this lay down a precedent that corporate lobbyists can rename other food? We rely on the FDA to protect our food supply and to keep food manufacturers honest. It's not their job to rewrite the letter of the law to enable food manufacturers to weasel around with what words mean. Click the link below to register your opinion - remember we only have until the 25th, so do this now! Pass the word to your friends who don't regularly read Retro Thing and let them know what's going on. Let's not forget that manipulating chocolate was a powerful metaphor in Orwell's dystopian "1984". So click below, and let's all work together to keep authentic "chocolate" from ever becoming retro. As a kid, there was a land of wonders on our way home from school. This Shan-gri-la was called "Elmwood Cleaners". Not only was Emily the local Avon lady and dry cleaner magnate, her shop was filled with all kinds of knick knacks and toys. It's where we could spend our pocket money on mini Rubik's Cubes and Wacky Wall-walkers. When Mother's Day rolled around, there were some crappy gifts that even a kid could afford. Among the "classiest" were these antique finished miniatures. 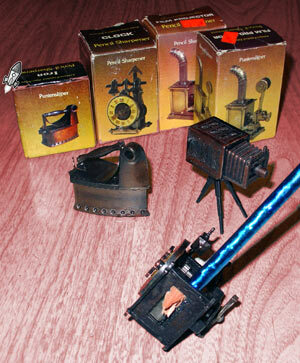 Not only were they models of gadgets of yesteryear, but they doubled as pencil sharpeners. Um... handy, I guess. 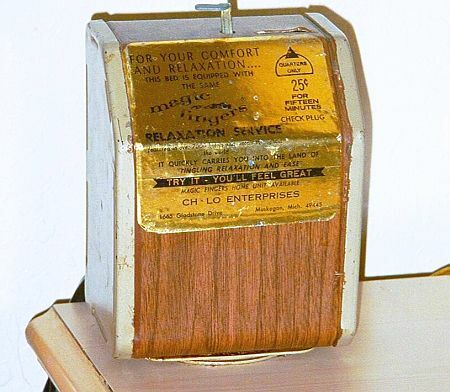 I can't place when these are from, but from the typography on the boxes, I'd guess that they're from about the 60's, but I still see these in gift shops from time to time today They're made of cheap pig iron, and so don't survive falls very well. I remember that each one featured at least one moving feature - the clock clicks as you move the hands around, the camera's bellows open up (conveniently dumping out the shrapnel from the sharpener), etc. 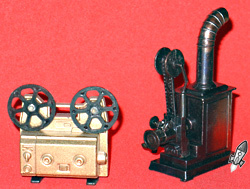 Check out the antique projector to the right of a model of a more modern super 8 model. Somewhere there were pencil sharpener craftsmen keeping up with the tech of the day. Might there be a Betamax pencil sharpener out there (emptying the pencil shavings by ejecting the tape of course...)? Mention an appreciation of 8 track tapes, and you'll get a lot of bewildered looks. 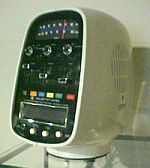 At one time 8-track was the only portable music format, and now it's been unfairly reduced to a punchline - a thick plastic icon of the 60's and 70's. There are a number of reasons to be genuinely sore at 8-tracks. You couldn't rewind the carts, the internal mechanisms could fritz out, and worst of all - the songs were often put on the tape in a different order than the album. 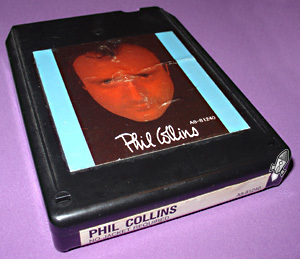 Re-sequencing songs could sometimes make the songs fit on the 8 track cartridge better. Even so, sometimes songs were actually split in the middle across multiple tracks. I'm sure that some of you might remember the big "ka-thunk" that could sometimes barge into the middle of your favorite tune. One more surprise up 8-track's sleeve is just how long it stuck around on the sly. Around 1984 8-tracks disappeared from most retailers' shelves, but determined fans could still pick up some limited new releases until about 1988 via mail-away record clubs. That's the story behind the Phil Collins 8-track of his massively successful solo effort, "No Jacket Required". That makes "No Jacket Required" one of the few albums that would have been concurrently released on LP, 8-track, cassette, CD, VHS, CED, and who knows what else since. I dreamed of owning a Roman chariot as a kid. All I needed to bring my dream to reality was a pair of ponies and a few hours in my grandfather's workshop. Alas, the ponies never materialized and my grandfather wisely suggested that I learn to use a saw and hammer before tackling any big projects. Little did I know that there are more practical ways to build chariots that don't involve ponies or lumber. 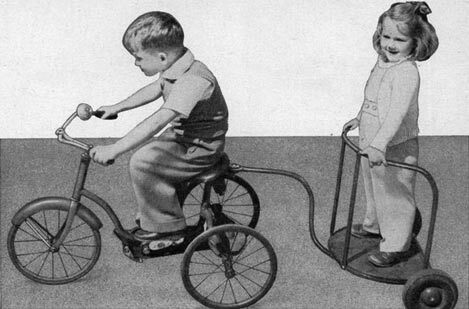 Here's a peek at a build-it-yourself tricycle trailer from the December 1950 issue of Popular Mechanics. Note the distinct lack of helmets, tethers, seat belts, air bags and padding. Ahh, the good old days.